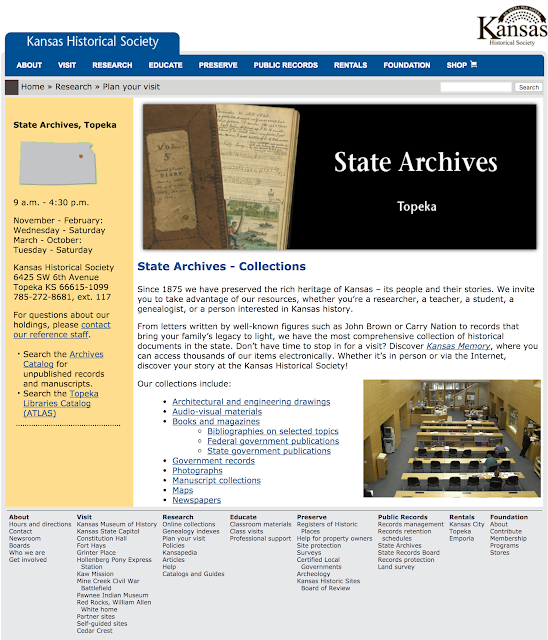 The National Archives (NARA) has a vast collection of documents created by the federal government. The records most often used by genealogists are census, military, land, and immigration records. It is true that the National Archives has a huge collection of documents. It is also true that some of these records are available to genealogists and are valuable for research, but this is only part of the challenge faced by the genealogical researcher. As I have written about recently, access is the main issue with doing research and the documents in the National Archives, for the most part, are not easy to access. Only a vanishingly small percentage of the documents in the National Archives have been made available in digital format. The next facility listed in the Research Wiki article is the Allen County Public Library in Fort Wayne, Indiana. 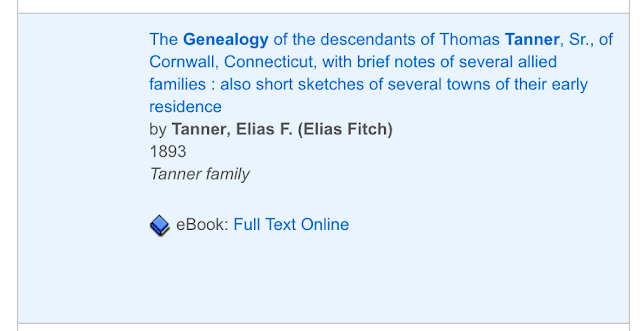 This is a marvelous genealogical resource location. But the real question involves more than an emphasis on genealogy, the real issue is the entire collection of resources available in the library. All of the libraries listed have access to online collections, in fact, most of us have access to the same online collections if we want to spend some money for subscriptions. Being able to go to a library to use Ancestry.com or Fold3.com is not as much of a draw as it was a few years ago. If we go to a list of the largest libraries in the United States, we will find some that are of notable interest to genealogists. Number one on the list of these large libraries is the Library of Congress with the Boston Public Library coming in second. Both of these libraries, simply by virtue of their huge collections are important places to do genealogical research. Third and fourth on the list are the Harvard University Library and the New York Public Library. If you review the rest of the list, you will see that these libraries fall into two distinct categories: they are either located in major cities or they are associated with major universities. So if you are interested in genealogical research, you should be looking at one of these libraries for documents. One important thing to remember when doing research is that the smallest local public library or historical society may have the documents you need to do your research. Large libraries simply have more stuff and finding what you are looking for increases with the amount of stuff available. But large libraries also impose their own challenges and learning how to find what you are looking for is a learned skill that takes a great deal of time and experience to acquire. But let's get back to genealogy. Which of these large libraries have the largest collection of genealogical resources? That is the real question. For a very long time, the Family History Library in Salt Lake City, Utah has claimed to have the largest collection of genealogically related material in the entire world. That is probably correct if you include their unsurpassed microfilm collection. But here we come to another issue. How many people do these libraries have available to directly help patrons with their genealogy? It is one thing to go to a library that has a vast collection of records and books and other stuff, but how do you get help with your genealogy? From this standpoint, there is no question that the Family History Library in Salt Lake City, Utah has the largest staff dedicated to genealogy as well as a major collection of documents and records. 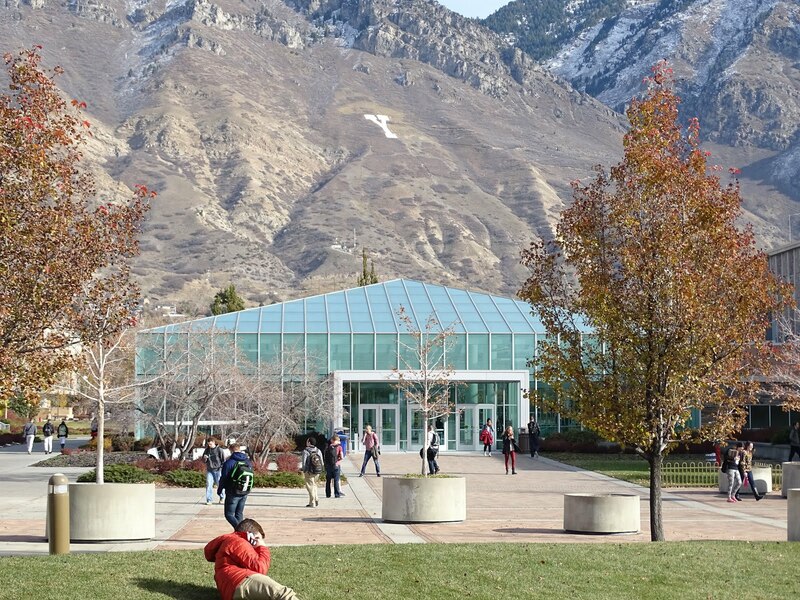 Now, what about the Brigham Young Univesity, Harold B. Lee Library? The Lee Library ranks number 53 on the list of the largest public libraries in the United States, but this list does not rank either the number of genealogically valuable collections or the number of support staff dedicated to helping patrons with their genealogy. For some time now, I have maintained that the BYU Family History Library, part of the Harold B. Lee Library, is the second largest such facility in the world. There are some important factors to consider when making such a claim. First, is the number of records, but in addition to having piles of records, those records must be accessible and then there should be a staff dedicated to helping patrons find the material they are looking for. As far as numbers, the BYU Family History Library has over 30,000 rolls of microfilm and tens of thousands of microfiche. 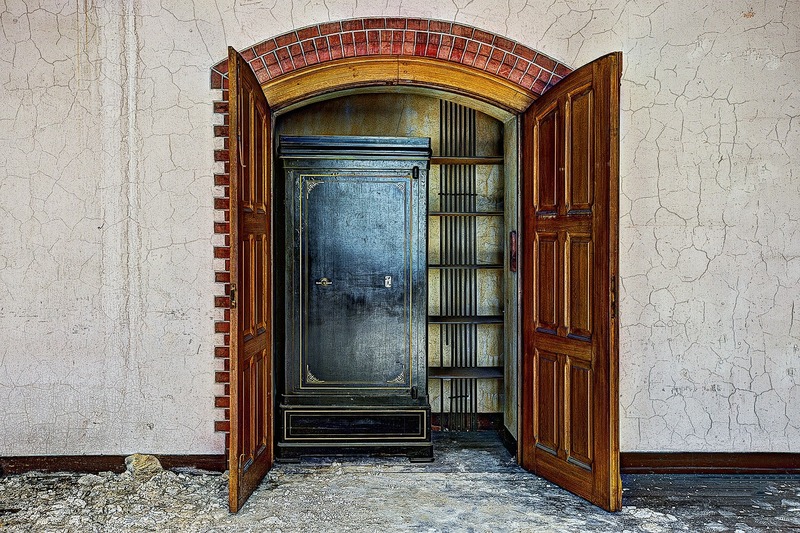 The number of books available in a large library is always a difficult number because genealogists rely on a broad spectrum of resource material from maps to biographies and local histories. So, in a real sense, the ideal genealogy library would not only have a huge dedicated collection, but also access to an even larger collection of books and records plus the bonus of haveing a dedicated staff to helping genealogically interested patrons. The BYU Family History Library has about 130 people who are dedicated to helping patrons with their personal research. When you take all of these factors into account, I can still maintain that the BYU Family History Library is the second largest such dedicated collection in the world. Now, here is another issue that I keep mentioning because of its importance. We are presently in a major transitional era as it pertains to information. For example, the Family History Library in Salt Lake City, Utah has around 356,000 books. Traditionally, to use these books, you would have to travel to the library. But now, as of the date of this post, 219,026 of those books have been digitized and put online. 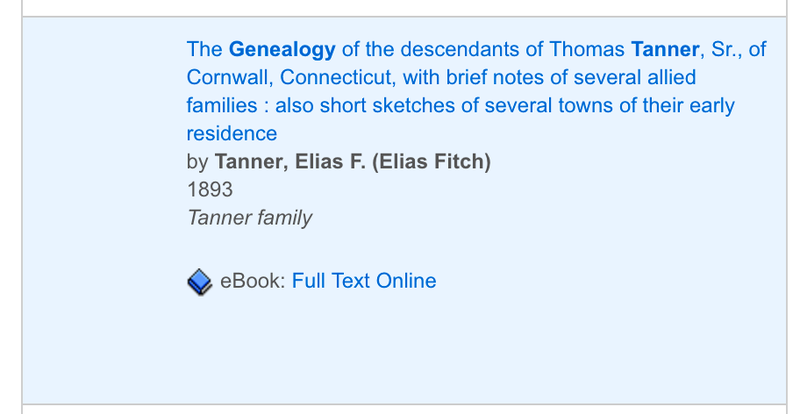 It is true that some of those online books can still only be accessed from the Family History Library, but in effect, most of those books can now be accessed by anyone with an internet connection. The same thing goes for the 2.4 million rolls of microfilm. Although the number of rolls of microfilm from the collection that have been digitized is not publically available, announcements have been made that the entire collection will be digitized in the next two years or so. The Library of Congress is said to have over 30 million books, but it also a fact that estimates are that more than that number of books have been digitized and are likely available online. So, as we keep progressing into this new age of digital, online records, I suggest that we start reconsidering how we view libraries. I can now usually do most of my research online, supplemented by a few microfilm records. I still use the paper book collections at the library and I still use the dedicated online resources at the libraries. But now, I would consider the staff and the help I receive as a more important issue than the numbers of records. Once again, I come back to my statements about the BYU Family History Library. OK, now what is the reality? Genealogists need to start realizing that research is research. Records are records and what we need may be in any one of the hundreds and thousands of repositories around the world. It takes time and a considerable effort to become acquainted with any library's collections so let's stop believing in so many "brick walls" and start realizing that we will never, individually, have the time to search all the places where the answers might lie. I have one family line where most of the evidence so far points to the fact that one of my Great-great-grandfathers was Jewish. My Tanner line come from New England and some of the lines go back to the early 1600s in America and then England. My ancestors in the Parkinson line are all English by way of Australia. The two Danish lines are the Christensens and the Ovesens. The last of the lines include the DeFriez family who are most likely Jewish and from England and perhaps remotely from Holland or The Netherlands but I have yet to find any concrete documentation. The last line is the Jarvis line from England. I have also mentioned that MyHeritage.com has found over 100,000 Smart Matches indicating that I share at least one ancestor with another person's family tree. Adding even more relatives would not be of much advantage since I cannot possibly handle what is already there in the program. But, I would note that there are a lot of people who probably would either be surprised by the results of a DNA test or could connect with unknown relatives. At this point, any DNA evidence that contradicts or expands this presumed heritage would be a real surprise. The main areas where DNA could show a difference is if there were some "adopted" children who were not the children of the recorded parents. If there are any "surprises" in the first six generations, then they will genuine surprises. Stay tuned, it should be interesting to find out the results but it will be a few weeks before that happens. Can you marry your cousin? What is or was the law? Throughout history, people have always had limitations on marriage between blood relatives. In some cases, the restrictions extended to clans or tribes and other cases the restrictions were limited to different levels of closer relatives. This question arose recently as I was doing genealogical research in a relatively small area of England. I was researching a descendant of the Bryan family when one of the Bryan descendants married another person with a Bryant surname from the same small area. I immediately wanted to find out how they were related. It turned out that they were third cousins. I have mentioned previously that my own parents are apparently second cousins one generation removed. All of these circumstances, plus many more, have reminded me of the culturally and legally imposed restrictions on marriage. (f) marriages between any persons related to each other within and not including the fifth degree of consanguinity computed according to the rules of the civil law, except as provided in Subsection (2). (b) if both parties are 55 years of age or older, upon a finding by the district court, located in the district in which either party resides, that either party is unable to reproduce. The basis for these restrictions has both religious and cultural concerns as well as an assumption that marriage between close relatives causes genetically, inheritable defects from "inbreeding." With some minor variations, all of the states in the United States of America have similar restrictions. It is a relatively common dramatic theme in movies, books, and other works of fiction to portray couples who unknowingly fall in love and subsequently learn that they are closely related. For genealogists, this is an underlying issue in some importance. In online family trees, I have often found where children have been shown to be married to their own parents or even grandparents thus causing the dreaded looping pattern that seems difficult to resolve. Here is an example of the position of the Catholic Church on cousin or near relative marriage. Here is a quote from Canon Law Chapter III, beginning with Canon 1083 from the Vatican website. §3. Sterility neither prohibits nor nullifies marriage, without prejudice to the prescript of ⇒ can. 1098. Can. 1085 §1. A person bound by the bond of a prior marriage, even if it was not consummated, invalidly attempts marriage. §2. Even if the prior marriage is invalid or dissolved for any reason, it is not on that account permitted to contract another before the nullity or dissolution of the prior marriage is established legitimately and certainly. Can. 1086 §1. A marriage between two persons, one of whom has been baptized in the Catholic Church or received into it and has not defected from it by a formal act and the other of whom is not baptized, is invalid. §2. A person is not to be dispensed from this impediment unless the conditions mentioned in cann. ⇒ 1125 and ⇒ 1126 have been fulfilled. §3. If at the time the marriage was contracted one party was commonly held to have been baptized or the baptism was doubtful, the validity of the marriage must be presumed according to the norm of ⇒ can. 1060 until it is proven with certainty that one party was baptized but the other was not. Can. 1087 Those in sacred orders invalidly attempt marriage. Can. 1088 Those bound by a public perpetual vow of chastity in a religious institute invalidly attempt marriage. Can. 1089 No marriage can exist between a man and a woman who has been abducted or at least detained with a view of contracting marriage with her unless the woman chooses marriage of her own accord after she has been separated from the captor and established in a safe and free place. Can. 1090 §1. Anyone who with a view to entering marriage with a certain person has brought about the death of that person’s spouse or of one’s own spouse invalidly attempts this marriage. §2. Those who have brought about the death of a spouse by mutual physical or moral cooperation also invalidly attempt a marriage together. Can. 1091 §1. 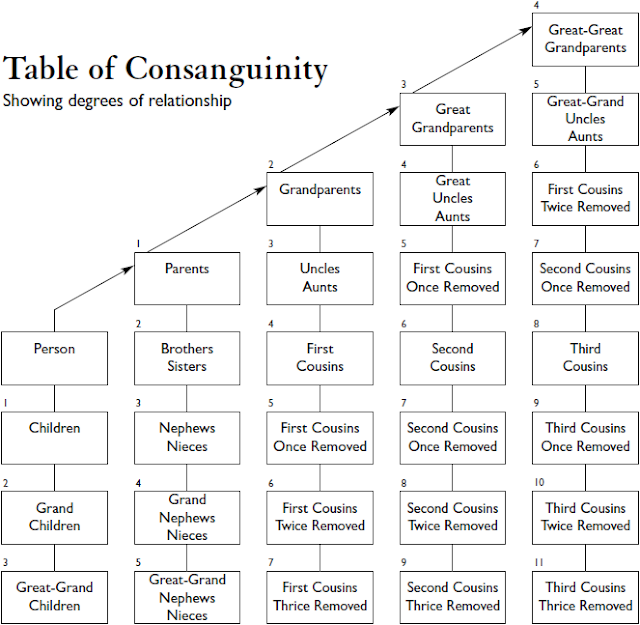 In the direct line of consanguinity marriage is invalid between all ancestors and descendants, both legitimate and natural. §2. In the collateral line marriage is invalid up to and including the fourth degree. §3. The impediment of consanguinity is not multiplied. §4. A marriage is never permitted if doubt exists whether the partners are related by consanguinity in any degree of the direct line or in the second degree of the collateral line. Can. 1092 Affinity in the direct line in any degree invalidates a marriage. Can. 1093 The impediment of public propriety arises from an invalid marriage after the establishment of common life or from notorious or public concubinage. It nullifies marriage in the first degree of the direct line between the man and the blood relatives of the woman, and vice versa.Can. 1094 Those who are related in the direct line or in the second degree of the collateral line by a legal relationship arising from adoption cannot contract marriage together validly. As you can see, the limitations on marriage are not confined to bloodline or consanguinity concerns, they extend to a whole category of religious and arguably, social concerns as well. In the Catholic Church if a couple wanted to pursue a marriage between cousins, for example, they were required to submit a petition to a bishop to permit the marriage called a dispensa matrimonial. When such a petition is submitted it is a goldmine of information about the family. These types of records are usually found at the diocese level. If you have a question about the legality of a marriage, you should research both the civil and church law in the area where your ancestors lived. Now, despite these restrictions, we should remember that there are those of our ancestors who may have consciously or unconsciously broken the law. Historically, we should also remember the history of the Church of England and its origin in a dispute between King Henry VIII and the Pope over a divorce and remarriage. These marriage restrictions can be historically important as well as applicable to obscure individuals. Can we design a program that can record both kinship and genealogical relationships? Of course, the answer to the question above is most certainly yes. But the real question is there a developer who has the incentive to develop such a program? The further question is whether or not there would be anyone who is even vaguely interested in purchasing such a program? Genealogical research originally focused almost entirely on bloodlines of descent. When I began doing research over thirty years ago, I found that many of my ancestral lines contained information about only the father-son relationships. Siblings, spouses, children and marriages other than those on the bloodline were ignored. I can still see the same situation, with father-son strings of ancestors, as I help people expand their understanding of the nature of their extended family. In fact, initially, there was almost no information about any of my own family lines beyond my surname and the lines of descent from prominent ancestors. The "traditional" goal of genealogists was to connect family lines to some famous or rich ancestor. Much of the interest during the 19th and 20th centuries was stimulated by the possibility of obtaining a neglected inheritance. Over the years, I have found that this same motivation has been preserved by a desire to connect to a lineage society or to obtain the "benefits" of belonging to a particular Native American tribe. Some groups, such as the members of The Church of Jesus Christ of Latter-day Saints, had a religious motivation for "seeking after their dead." But even in this case, until recently, the "dead" consisted of the bloodline ancestors. I still find that genealogists, no matter what their motivation, are generally interested only in those people they consider to be "relatives." This is, of course to some extent, what genealogy is all about. There are two major polarities in our society in the United States. At one extreme, we have people who live in immersive, extended families. Family gatherings are a regular part of their lives and they are usually aware of a pool of cousins and collateral relatives. At the other end of this spectrum are people who were raised in almost total isolation from direct interaction with their relatives. 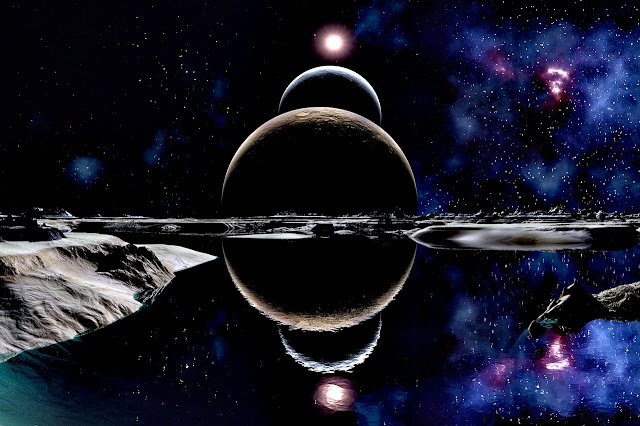 My own personal experience was much closer to the isolation extreme than it was to the immersion extreme. While I was told we had a lot of "relatives" my interaction with these relatives, with a few exceptions, was extremely limited. My Tanner grandparents both died before I was born and for some reason, unknown to me, we had almost no contact with any of my father's relatives with the exception of the family of one great-grandmother. But our contact was always quite formal and never very personal. So my genealogical research has been largely a voyage of discovery. Whatever our personal involvement in genealogy and no matter how many or few relatives we know personally, genealogy in the United States as inherited from Europe, has focused on a relatively narrow interpretation of the concept of relationship. We have many relationships that are undefined in English. For example, let's suppose that one of our siblings married a person who had been previously married and had children. What do we call the children of the spouse of a sibling from a previous marriage? Would you consider yourself related to this person? What if those children were grown up and married and had children of their own? How are you related to their children? What do you call these children? When we are doing genealogical research, we need to know about, not only those we consider to be relatives, but those considered to be relatives by our ancestors. In addition, it is important that we develop methods of recording and documenting those relationships. So today, I finally had time to take the DNA test. I opened the package and read the entire instructions. After following the instructions, we decided to mail in the completed test. We normally have to drive to a post office to mail a letter in Provo (as we usually did in Mesa) since the days of having mailboxes for pickup is long past. We weighed the package containing the test and according to the weight, put one stamp on the outside of the mailer. When we got to the post office, we decided to mail the item inside, because it was below freezing in Provo. When my wife went to insert the mailer in the slot, it would not fit. The postal employee said that the package was thicker than allowed by the U.S. Post Office and that had we mailed it with one stamp, it would have been returned for insufficient postage. It cost $2.62 to mail the item to MyHeritage. Hmm. I wonder how many of these are coming back to potential customers. If we had dropped it in the bin outside the building, it would have been returned. Anyway, after buying the right amount of postage, the DNA test is on its way and we are now waiting our "4 to 6 weeks." according to the instructions. 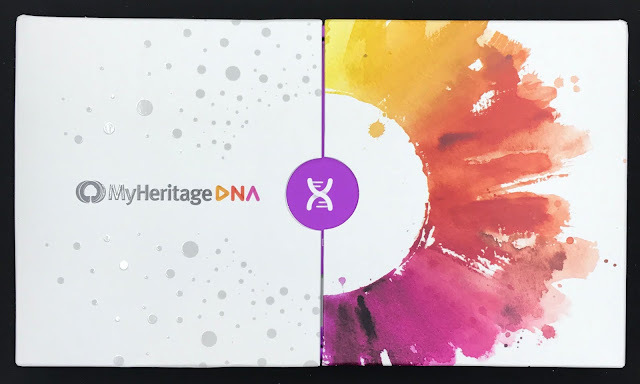 We had a busy holiday and so I finally got both the time and the opportunity to send in the MyHeritage.com DNA testing kit. I had a few email questions about why I choose MyHeritage.com instead of one of the other companies. I thought I had given some good reasons in a previous post, but apparently not. 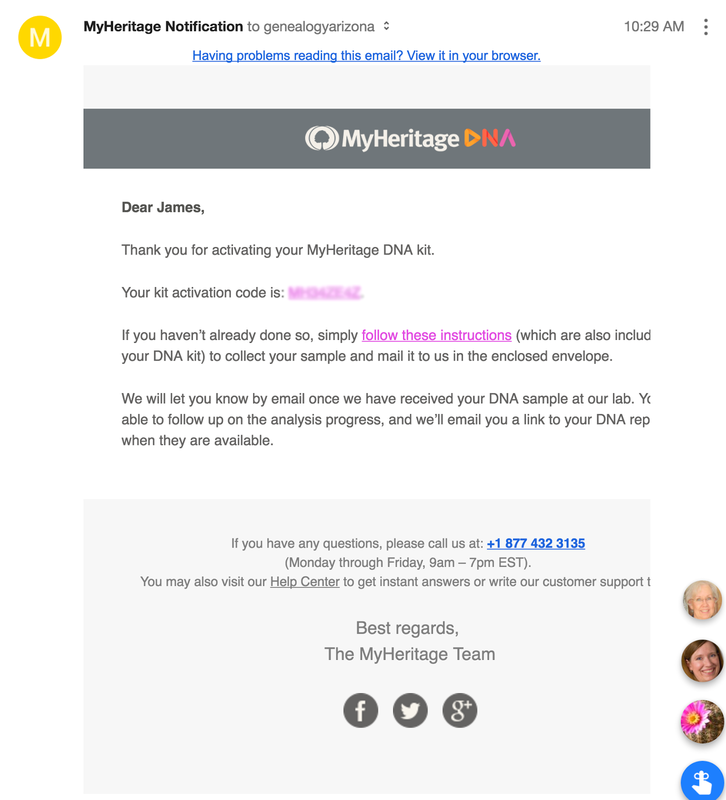 Here are several specific reasons I started with MyHeritage. I have a long-standing relationship with the company and many of the staff are friends. I have always received the best possible help and responsive service from the company and I admire them for pushing the genealogical technology. I knew if they did a DNA testing program there would be the best possible technologically advanced matches. MyHeritage.com has found over 100,000 Smart Matches from my personal family tree. This means that they have already identified this huge number of potential relatives and so a DNA test from MyHertiage could already take advantage of this pool of potential DNA contributors. 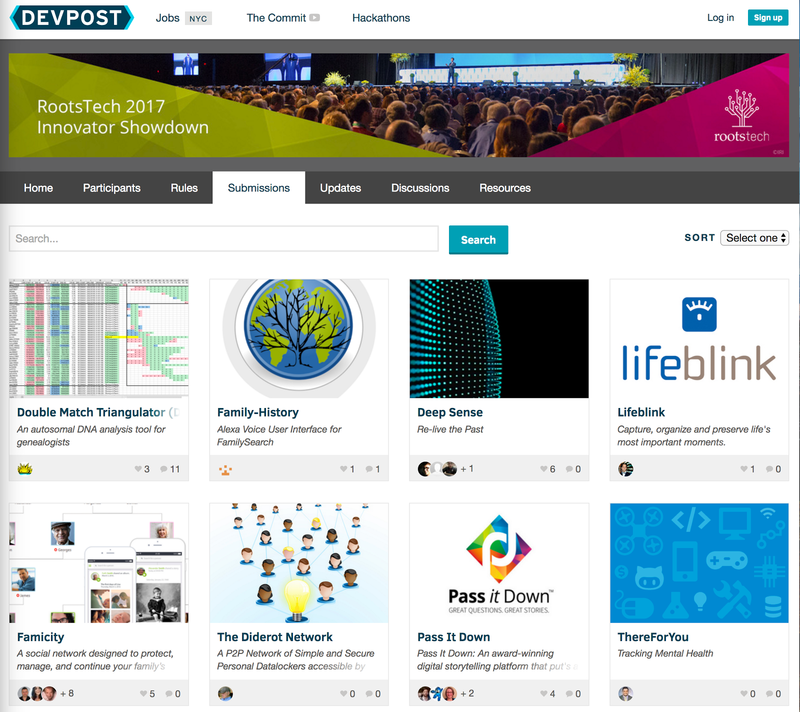 I will be doing a presentation at RootsTech 2017 for MyHeritage about their DNA program. I felt it was time to do a DNA test, simply for the reason that I intended to write about the test and I like writing about MyHeritage.com. 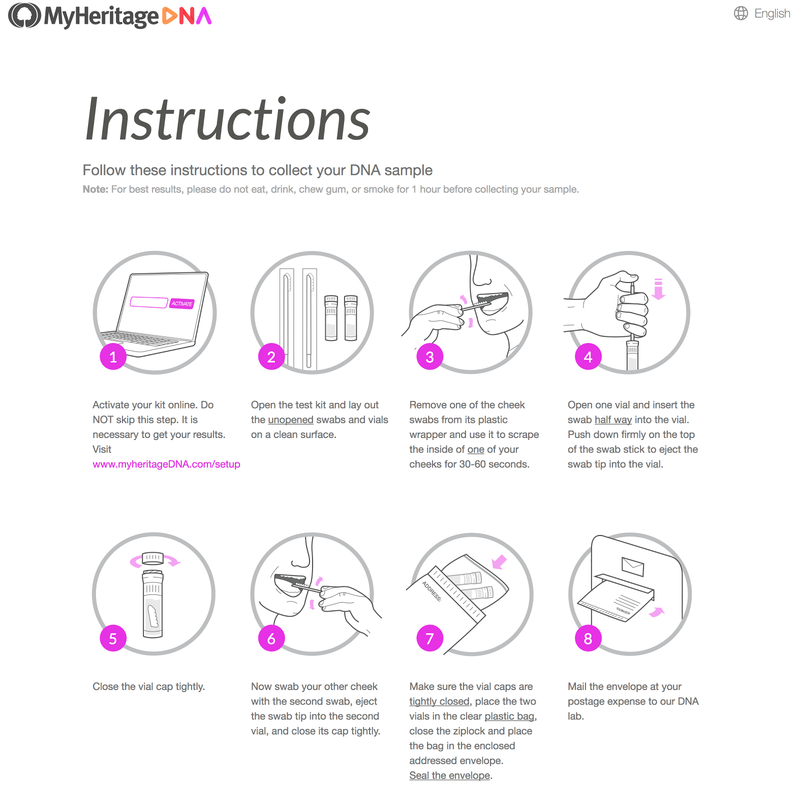 Having a DNA test done by MyHeritage does not rule out using another company to do another test. I have spent a considerable amount of time researching and learning about DNA testing and I feel I am prepared to have specific opinions on the subject. I am interested to see how this develops. Since I already have a documented family tree on every ancestral line back at least seven generations, I am really not expecting any surprises. But you never know. Back in the 1800s, some scientists began to discover that the world of microorganisms might be the cause of some, if not all, diseases. At first, this was called the "Germ Theory" of the origin of diseases. Few of us now realize that the doctors of the time did not sterilize their medical instruments and did not even wash their hands. Many people, including many mothers of newborns, died as a result of germ contamination. Most of the medical community rejected the "Germ Theory" as unproven and did not wash their hands regularly when treating patients thereby transmitting the diseases they were trying to cure. Complete acceptance of the "Germ Theory" did not occur until well into the 20th Century. The Germ Theory is so well-known and accepted now that we have people who are "Germaphobic" and wash their hands excessively and impulsively. What does this have to do with genealogy? The analogy here is between the tradition-bound doctors, who rejected a "new" theory and the genealogists who refuse to consider almost anything that is outside their "traditional" view of how genealogy is practiced. We essentially base our understanding of genealogy on a strictly biological basis overlaid with an entirely Western European genealogical relationship model. Anything that does not fit within our predetermined family and relationship structure is simply ignored. Just like the doctors failing to heed the warnings about washing their hands before and after treating patients. I have written about this issue several times in the past and just recently in a post called, "Who are my relatives?" The interesting thing about this issue is the total lack of interest and impact that writing about the subject has on the genealogical community. However, in this case, the existence of kinship systems are not a "theory." I do not have to try to prove to genealogists that kinship systems exist, so why are they so universally ignored? The answer is really quite simple. They do not fit well within the preconceived and predetermined genealogy template we impose on our understanding of biologically-based genealogy. Our present view of genealogy has additionally developed an imperfectly overlaid emphasis on names and naming patterns. We find so-called genealogists who match up relationships based entirely on the "same name equals the same person" syndrome thereby even ignoring the need to establish a biological relationship at all. When I asked the question about the identity of my relatives in my previous post, I was serious. Who we consider to be our relatives is both biologically and culturally based. To some extent, our linguistic naming patterns reflect who we consider to be a relative and who we ignore as unrelated. One quirky example of this strange genealogical system that has evolved is the background interest in how we are related to "famous or notorious" people. I can go online right now and find genealogically oriented blog posts asking a question if we are related to some new celebrity or another. If you would like an example of this phenomena just do a Google search on the term, "are you related to," and see the results. The truth is that in becoming fixated on our rigid system of relationship as illustrated by the following chart, we have ignored the reality of broad relationships that exist around the world. We console ourselves by thinking we have solved this nearsightedness by adding in step-relationships and adoptive relationships. I have used this example a few time previously, but it bears repetition. In many places in the world, when a child is born, in addition to the biological parents, there are some surrogate parents designated by cultural or societal tradition. These surrogate parents are sometimes called godparents or "padrinos" in Spanish, "padrini" in Italian, "Paten" in German, and so forth. Where would you put the names of the godparents in your present genealogy database program? When I am helping people with research into Catholic Church records, I inevitably point out that the godparents are named in the parish registers and could be valuable genealogical clues to additional relatives. But I also note, that my suggestions are almost universally ignored. Here is another example. Let's suppose that you are doing research about an ancestral family and find that the parents in the family with a number of children, both died leaving the children as orphans. Who will take care of the orphaned children? No one? In some societies, unlike our present one, the structure of who will take care of the children is well established. In some ancient societies, when a married man died, his brother had the obligation of marrying the widow. Of course, I could go one with more complex examples, but all these examples have a decided impact on genealogical research and our collective lack of awareness of these relationships not only hampers our research but also often prevents us from discovering our ancestors at all. We sometimes refer to the expanded view of kinship relationships as "cluster research" but even with the use of that term and methodology, we are still, in effect, ignoring the vast and complicated set of relationships that actually exist. Genealogists are confronted with a multitude of limits to their ability research their ancestors and relatives. Some of those limits involve time and economic resources, others include lack of experience and education such as language barriers and the challenge of old records. But as time goes on we become more involved and experienced, we seem to experience more limitations imposed by libraries, archives, and other repositories. These artificially imposed limitations are often cloaked in a mantle of legality. I have found that in many cases the "legal" excuse is a way to avoid confronting the real issues behind restricting access to records and even entire collections. In writing about this subject, I am not complaining, nor am I questioning the physical restraints that are placed on valuable, original documents because of their age or delicate condition. In some cases, even ordinary photocopies of documents are restricted due to control issues. Basic to this access problem is the underlying issue of "ownership." This "ownership" issue bedevils genealogists at a variety of levels, but I am going to focus on the libraries and archives. I am not questioning the ability of both libraries and archives or all kinds to protect their collections. Normal security measures are very important to preserving the integrity of any collection, but I will point out that many access issues go way beyond any reasonable protection issues and involve, in some cases, inappropriate restrictions on research availability. As I review the access requirements of various libraries and archives, I find a broad spectrum of restrictions. At this point, I need to discuss a few examples. First and most likely to be overextended are the government imposed "copyright restrictions." Copyright laws exist in almost every country of the world. The basic idea of copyright law is to restrict the reproduction and/or copying of certain protected "works" as defined in the variously applicable laws. 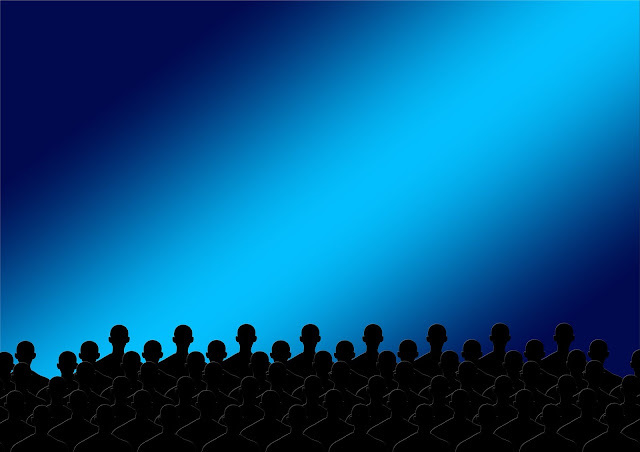 One of the basic ideas behind copyright protection is the idea that the author or originator of a particular work should have the "benefit" of the commercial value of the work for a certain time period. Unfortunately, in the United States and a few other countries, the concept of what is and what is not protected has morphed into a blanket protection that is used by entities, other than the author or originator, to enhance their own commercial interests. For the researcher, determining what is and what is not subject to a copyright claim has become nearly impossible. I was once involved in a copyright claim in the United States Federal District Court where the plaintiff (the complaining party) claimed a copyright interest in a document that dated back into the 1840s. Becuase the plaintiff was a large corporation and the defendant (my client) was an individual with limited resources, the corporation essentially used the cost of the copyright lawsuit to browbeat my client into acknowledging its interest and put my client out of business. “Library Copying.” Stanford Copyright and Fair Use Center, April 2, 2013. http://fairuse.stanford.edu/overview/academic-and-educational-permissions/library-photocopying/. However, there is a more serious aspect of this same issue. 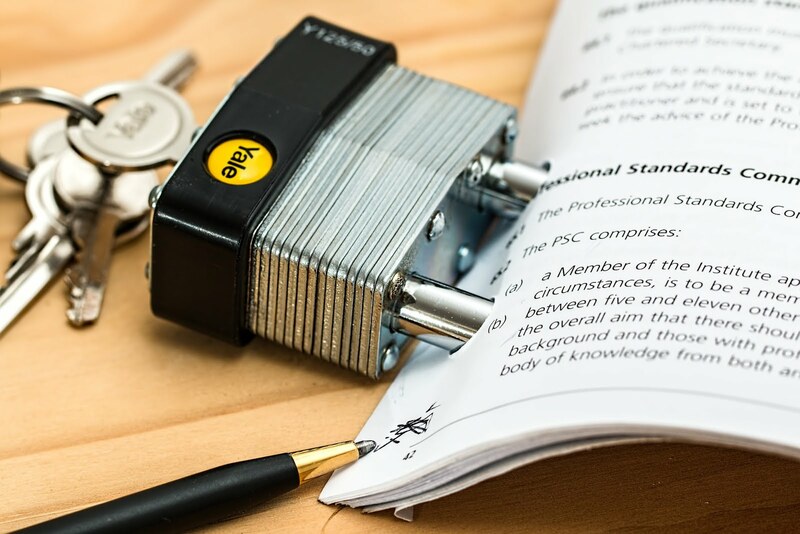 In many cases, libraries and archives have attempted to obtain protection for documents that are clearly not covered by copyright and are in the public domain. In these cases, the institution places a notice on the documents or records claiming that there are "contractual" reasons why the records are not available to copy or research. An example of this type of claim is easy to find online. Usually, the claim involves photographs where the institution has ruined the image by placing a large "watermark" notice even for photos that are clearly in the public domain. Another way this is done is by simply restricting access at all to only a certain select number of possible users or where the document might be physically viewed at all. In some cases, such as the U.S. National Archives, accessing the records is simply made so onerous and difficult that few researchers will go to the trouble of even trying to do research in the facility. See "Plan Your Research Visit." Most university libraries' special collections sections have some type of research restrictions also. With U.S. government documents, we run into issues of restricted access based on classified documents. The United States has various laws concerning freedom of information that can be used to obtain access to certain documents, but again, that can be an expensive and time-consuming alternative. The most difficult access issues involve private entities. Certain church organizations, for example, claim ownership of their records and other documents and will not allow public examination at all. Other churches restrict access to only "approved" researchers and may impose restrictions even on the approved researchers. Although I am not a practicing or licensed attorney since my retirement, I can suggest that when you are faced with an access situation, you make sure you understand exactly the context and basis for the claim of restricted access. Some situations are not resolvable. If a church refuses you access, you have no real recourse. But if the U.S. government refuses you access of fails to adequately allow access, there are remedies. If you see a private institution defacing online images with a "watermark" simply to promote sales of those same public domain images, make your objection known and challenge the claim where appropriate. You may, in some extreme cases, need to talk to or hire an attorney. Just make sure when you do, that you are talking to one who is well acquainted with intellectual property law in the country involved. 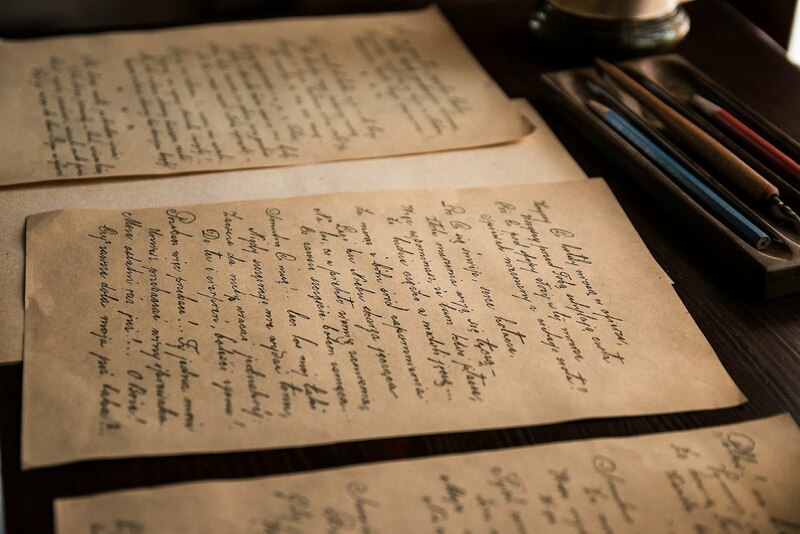 Probably the most sought after goal for assisting genealogical research is automated handwriting recognition, sometimes known as HTR or Handwritten Text Recognition. 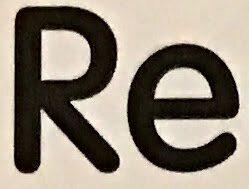 Computer recognition of printed text has already come a long way and many genealogists have been using OCR or Optical Character Recognition software for many years. In fact, nearly all of the searchable books and other documents online have been run through an OCR program. 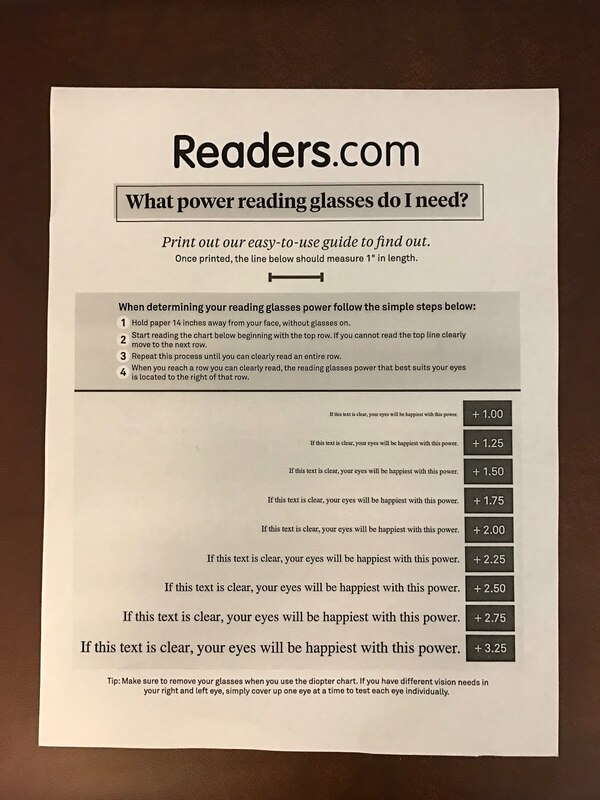 I once lost the computer file of some of my oldest journals but I had printed out a copy and was able to use OCR to reconstruct the computer file. However, because so much of what I do comes from the internet or in PDF format, I no longer need to rely on OCR programs per se. Currently, Adobe Acrobat DC or Adobe Acrobat Pro both automatically apply OCR to any PDF document and allow those PDF documents to be edited. I have written about this subject a couple of times previously. See the following. 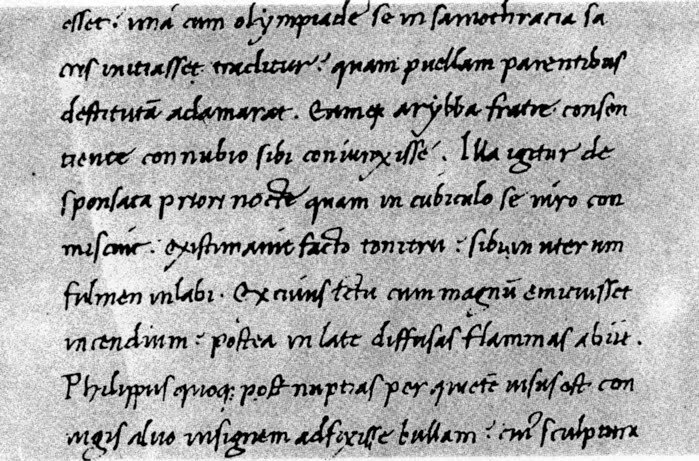 Is Handwriting Recognition the Holy Grail of Genealogy? I am also aware, as I indicated previously, that the BYU Family History Technology Lab is working on handwriting recognition and has been for some time. Handwriting recognition is a completely different matter. The individual variations in handwriting have, so far, defied almost all attempts to employ consistent handwriting recognition. 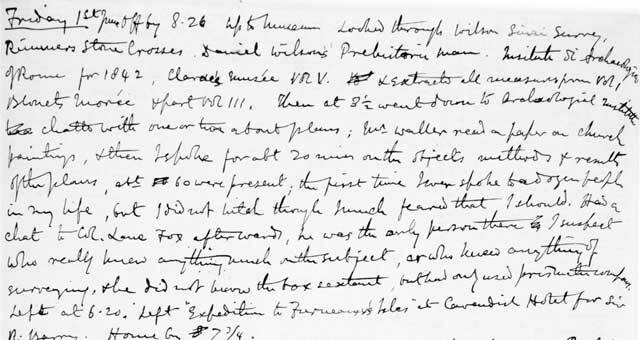 There are a number of highly skilled computer programs used by the U.S. Post Office and other similar organizations for automating handwritten envelopes but in almost all cases, the handwritten portions are ultimately reviewed by a human worker. Efforts to utilize handwriting recognition are split into two distinct usage areas: those programs that are aimed at personal and organizational uses where the writing is done on a tablet computer and those programs that are aimed at translating paper-based, already existing handwriting. Depending on the representational system used, i.e. Roman alphabet, Cyrillic, Chinese, Japanese etc., there is also a challenge in translating the characters from one system to another. Behind the language itself exist the variation in kinship patterns and genealogical relationships. Let me give a few simple examples. The first concern is the challenge of translation. If I ask the Google Translate program to translate the phrase "egg salad sandwich" into Spanish, I get "Ensalada de huevo," literally, "egg salad." I end up losing the "sandwich" part altogether. Using the SpanishDict.com website, I get "sándwich de Ensalada de huevo," which is a literal translation of the phrase from English. But it is likely that Spanish would properly say, "sándwich de Ensalada de huevos." with the word for "egg" in the plural. The English version of "egg salad sandwich" does not imply that only one egg is used in the recipe. The word "egg" becomes a preposition in English and is used in the singular form. Egg salad is a type of salad or filling used to make a sandwich. This is a rather simple example but illustrates the difficulty in translating one language to another. Can we expect our handwriting recognition software to be sophisticated enough to differentiate between these nuances in meaning and word usage? Now, to have an adequate handwriting recognition program, the program would have to somehow incorporate the vast number of social and cultural nuances present in each of the target languages. Here is an example of some current handwriting. You can immediately see the challenge that anyone might have reading this handwriting much less the difficulty of programming a computer to read it. Here is an example of what a genealogist might be faced with deciphering. And this example is amazingly clear and readable. Notwithstanding the difficulty of the challenge, there are quite a few institutions and other entities working generally on the problem. As is the case with many technological advances, the companies working on developing new, salable products are not interested in discussing their breakthroughs with other companies out of a fear of losing the patents to their products. 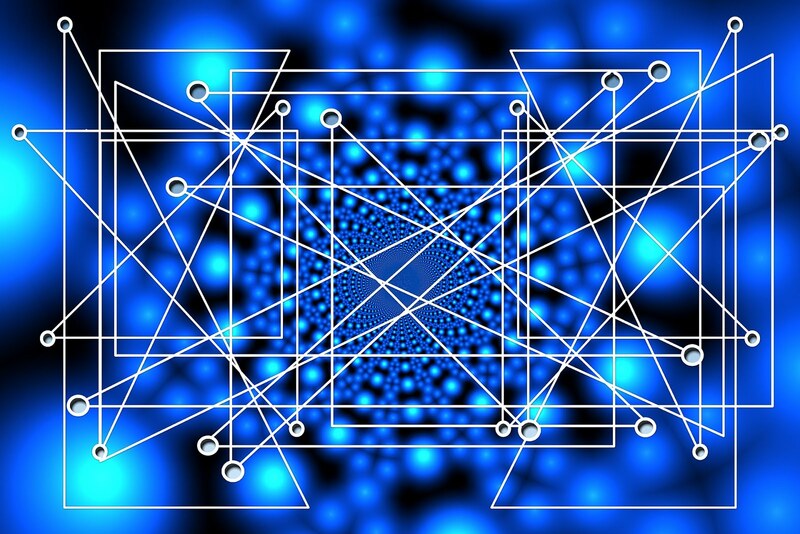 One thing is certain, with more and more powerful computers with sophisticated artificial intelligence programs, there will be significant progress in the not-too-distant future in this area. Some time ago, I finally decided to "bite the bullet" and take a DNA test. Of course, I decided to start with MyHeritage.com because I have already got over 100,000 SmartMatches and that means I already have a large number of "relatives" on the website. Unlike many, I am not seeking to find any more relatives. I have written a number of posts about DNA testing and if you want an interesting perspective on DNA testing you can do a quick Google search on "James Tanner genealogy DNA" and get some interesting posts and other information. 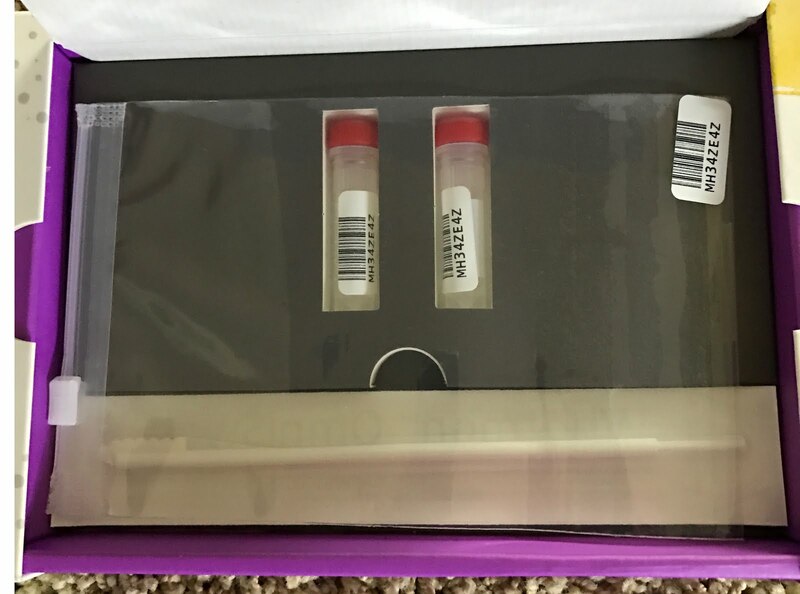 I got the test kit in the mail on December 24, 2016. Since I am involved in family Christmas activities, it will probably be a couple of days before I take the test and send it back to the testing facility which I understand is in Texas. Here is the packaged opened. You can assume that in the next few days, I will have taken the DNA test (I am worried I might fail!) so the next post on this particular subject will be on the test results. Now, this does not mean that I won't write some rank speculation about the results before they come. It will be interesting to see if my well-developed expectations will match the matching. Eggan, Fred. 1937. 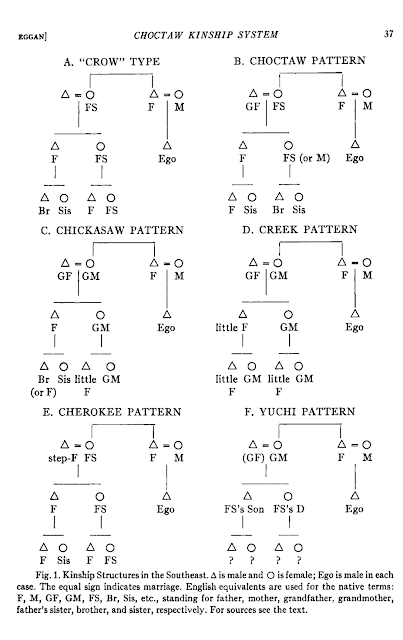 Historical changes in the Choctaw kinship system. [Indianapolis]: Bobbs-Merrill. From my perspective, the standard, Western European-centric pedigree chart based on an assumption of bloodline-based relationship systems filters out many other important familial/kinship relationships that have historical and genealogical significance. I have written about this issue from time to time, but recent experiences in helping people from someplace other than Western Europe have highlighted that fact that I am not always communicating well when I try to force their kinship structure into our "standard" format. My father’s sister’s son is my father, Alt’-kl, whether Ego be a male or female; his son is my father again; the son of the latter is also my father; and this relationship theoretically continues downward in the male line indefinitely. The analogue of this is to be found in the infinite series of uncles among the Missouri nations, applied to the lineal male descendants of my mother’s brother. See L. H. Morgan, Systems of Consanguinity and Affinity of the Human Family (Smithsonian Contributions to Knowledge, Vol. 17. 1871), Table II, 28, 29; Swanton, Source Material for . . . the Choctaw Indians, pp. 84-90. Perhaps, you can see that the European relationship implied by the English language term "father" is inadequate to express the relationships expressed by the Choctaw kinship system. Those of us with European ancestors actually use two types of terms to refer to our families; we say our "father's brother" which implies a genealogical relationship and our "uncle" which is a kinship term. Some of the online genealogy family tree programs accommodate different language naming patterns such as the difference between the pattern used in England and the pattern used in Spain, but few programs support the entry of kinship relationships. Because of this lack of support or even awareness of kinship relationships, there are likely a number of "brick wall" situations that are more apparent than real. 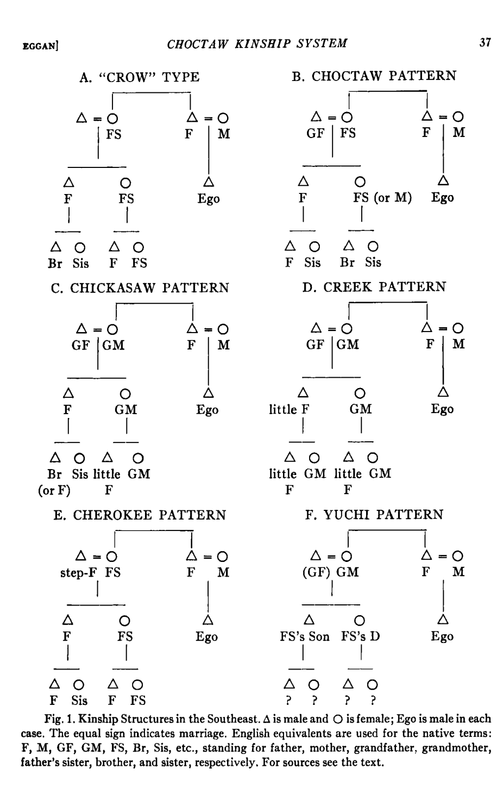 For example, using the Choctaw example, if a record showed a certain person as your ancestor's "father" how could you be sure that the reference was to the biological father? In our European-American kinship system, as reflected by our terminological system (naming system) we make no distinction between our maternal and paternal relations. For example, if a person is my "uncle," my reference to this person does not differentiate between my father's brother and my mother's brother. Because I hear and see very little discussion about kinship systems among genealogists or in the genealogical writing, I can only assume that there is little understanding or knowledge of the impact of kinship on the way genealogical relationships are recorded and preserved. Peterson, Gary W., Suzanne K. Steinmetz, and Marvin B. Sussman. 1999. Handbook of marriage and the family. New York [u.a. ]: Plenum Press. 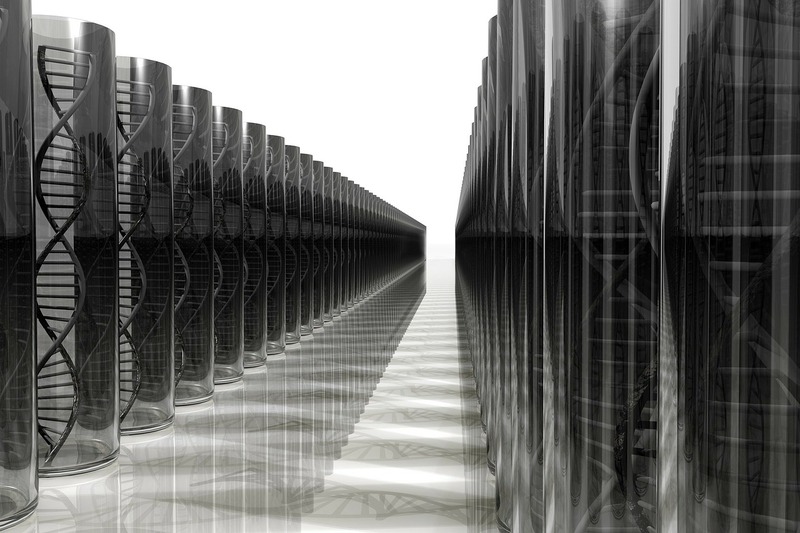 Many genealogists seem to be overwhelmingly insular in their outlook about research. The concept that "my people came from [fill in the blank]" seems to permeate their interests and outlook. It may well be that your family came from Pennsylvania or New York or even Germany or Scandinavia but the reality of researching records is that records pertinent to your family's history may be located practically anywhere. Are you prepared to say that you know for certain that none of your extended family members including all of your cousins to the nth degree live in Kansas? Are you also prepared to maintain that none of the records containing information about your family are not hidden away in the archives and libraries of Kansas? One of the most impressive collections of resources is found in "Kansas Places." Here is a list of the resources available from the website. Post Offices The database can be searched by date, town or county to find every known Kansas post office with its dates of operation. Little Known or Extinct Towns of Kansas ("Dead Towns") Index of approximately 4500 Kansas towns from the territorial period to ca. 1940. Townships in Kansas In Kansas, townships are a government entity larger than a town or city but smaller than a county. Counties Brief histories of current and former Kansas counties with a map showing their location and links to additional resources. Cemeteries in Kansas, 1906 A list of Kansas cemeteries, published in 1906, that gives the cemetery location, but not the names of the people buried there. My point in highlighting Kansas records and those of other locations is to emphasize the need for genealogists to broaden their perspective about where important records might be located and to be more aware of the opportunities that exist for research into the various parts of the world. True, we all have only a certain limited amount of time in our lives to do research, but it helps to know that there are a lot of places to look. When we get discouraged or tired, we can become rejuvenated when we find a new place to look. It may be true that the Salt Palace has "free WiFi for attendees," but when there are a lot of people in the Conference Center, WiFi is not reliable. If you need a constant internet connection for some reason, be prepared with your own personal hotspot. Ambassadors (FamilySearch's name for bloggers) who are invited to the Conference, have access to land lines in the Media Hub. But entry into the Media Hub is closely monitored. Bringing a battery backup if you have one, is a really good idea. Some people find the temperature in the Salt Palace to be cooler than is comfortable, but outside it will be cold. The weather along the Wasatch Front is highly unpredictable. The outside temperature could be a warm 45 degrees or it might be below zero. Some years, even when the Conference was in March, we had snow. If you come from a warm climate, you really do need to be prepared for cold weather. After my first year at RootsTech, I went out and bought very comfortable walking shoes. I have tried to have the most comfortable shoes I own each year since that first experience. The Salt Palace is huge and Salt Lake City blocks are long. If someone says that something is about two blocks away, that can mean a walk of over a half a mile to go and return. The blocks are 660 feet long and there are 8 to a mile. Salt Lake City is a walking city, but only if you are accustomed to walking miles at high altitude. Downtown Salt Lake City sits at 4,226 feet above sea level. That is higher than many of the mountains that most people are used to seeing. Just think about it and plan ahead. The events are really nice and worth attending. You should plan ahead for classes and in many cases, you may have to hurry to the classrooms to avoid missing out on a seat. Predicting which classes will fill up and which will not is practically impossible. Look at the schedule. 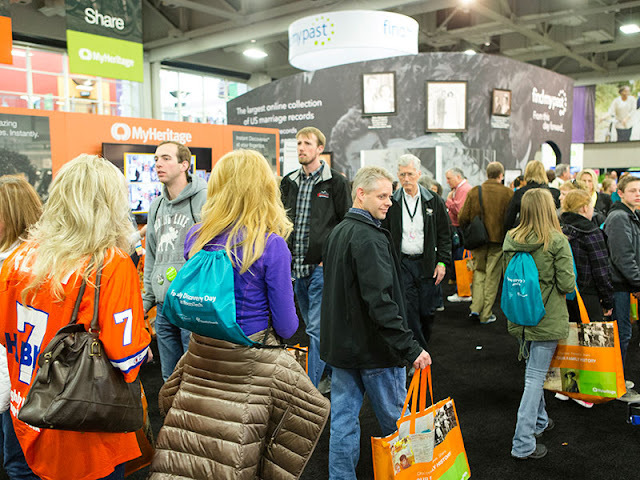 Talk it over with someone who has been to RootsTech before and make plans but also be ready to change your plans once you get to the Conference. Many of the attendees miss out on visiting the Exhibit Floor. For me, this is not only the highlight of the Conference but also where I spend nearly all my time. This year I will be teaching on the Exhibit Floor for different vendors. I will also be writing my blogs and talking to all my friends. The last two years, I have hardly made it out the Exhibit Hall while it was open. Make time for the Exhibit Hall and you will get a lot more out of the Conference. I have written about this in past years and after living in Utah Valley for a couple of years I have an even more, in-depth, perspective on the traffic situation in Salt Lake City. If you want to live through your visit to Utah, you need to know that unless you have experience driving in Mexico City or Panama City or a similar location, you need to be overly cautious. Utah drivers rampantly run red lights. I have seen as many a five cars go through a red light in one intersection. Not just turning red, but red red. The Freeways are interesting. You have people that insist on going the speed limit even when the rest of the traffic is slamming on their brakes to avoid collisions with the slow drivers. On the other hand, the traffic can be moving at 10 miles an hour over the speed limit and some drivers, usually large pickup trucks, can be swerving in and out of traffic at over 100 miles per hour. By the way, don't count on the Freeways during rush hour especially if there is snow, they can be really long parking lots. Oh, if it does snow, just remember, in Utah many people have 4-wheel drive cars and trucks. When it snows, they drive faster than normal. Don't miss visiting Temple Square. Don't miss visiting the Family History Library and the Church History Museum right next door. Take time to go to the Tabernacle for an organ practice or concert. Do not miss the Tabernacle Choir on Thursday, February 9th. at 8:00 pm in the Conference Center. Take time to look around. Salt Lake is one of the most beautiful cities in the world in a dramatic setting. Oh, by the way, it does have its share and more so of panhandlers and beggars. It is a mecca for the homeless. Many people wonder why we moved from Mesa, Arizona to Provo, Utah. Really now, all you have to do is live here for a while and you will know why we did. This is especially true if you are a genealogist. I have been using my iPhone to capture copies of documents and text from books to save the time and expense it takes to make a photocopy for the past few years. Presently, there are a huge number of scanning apps available for both the iOS and Android smartphones. 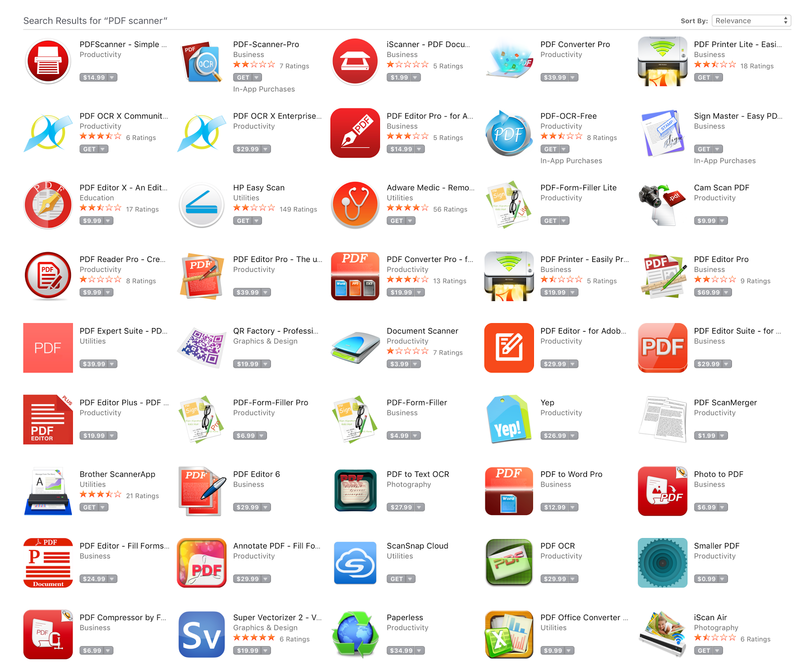 The free apps are usually quite basic and really do little more than the standard camera app that comes with the device. You could spend a lot of time trying out different apps and there are a number of these that are targeted at the genealogy marketplace. A while ago, I compared my new iPhone 7 Plus with my Sony camera. See "iPhone 7 Plus vs. Sony Cybershot DSC-HX400V." That post dealt with the issue of detail resolution between the two cameras. The main issue for genealogists is whether the cameras in the smartphones are an adequate replacement for a dedicated scanning device. The answer to this question is easy. NO, they are not. The issue is not the scanning app. The issue is the resolution or detail of the images produced. In addition, as I have learned over and over during the past years, you cannot take adequate photos of documents or photographs without a tripod or camera stand and uniform lighting. In promoting the smartphone camera apps for scanning genealogically significant documents and as a replacement for a dedicated flatbed scanner or a very high-quality digital camera, the promoters are not being forthcoming with their intended customers. The phrase here to focus on is "quick and dirty." Of the issues facing the use of a smartphone to replace a scanner, the most important ones are holding the camera steady, making an image when the camera is perpendicular to the surface of the paper, and obtaining uniform lighting over the surface of the paper. It is also important to remember that if we are making a copy of a copy, then we are already, at least, two generations away from an original. Here are some example of the problems. I am using my iPhone 7 Plus with a 12 Megapixel camera. Your results using your own smartphone may vary. Hmm. What should I use for an example? How about a simple, rather crude eye test sheet like the ones you see in drugstores? Here is a digital copy of one such sheet. This is directly from the website Readers.com. This is not a photo. This is a screenshot of a PDF downloaded file. But I am going to show the detail in the PDF file. Here is part of the image at 1200% magnification. Now, let me take a photo of the same page using my iPhone. First, handheld with the available light. First of all, I have to use a printed copy of the document. That means that the resolution of the print will be about 300 dpi or the resolution of my printer. Also, since I don't have a color printer, the image is in grayscale rather than color. Here is the image from my phone. Remember the image is handheld and uses available light. Hmm again. It looks pretty good, all things considered. Now I will take the photo into Adobe Photoshop and magnify the same part of the photo. This is the image from the iPhone at 1200% magnification. Pretty good actually. Certainly, acceptable for research purposes. 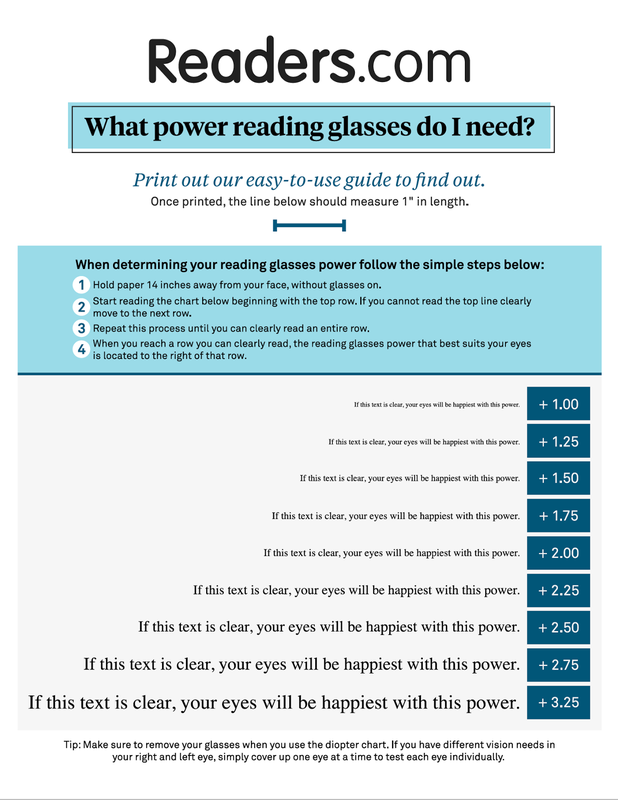 It would also be sufficient quality for OCR (optical character recognition) purposes. My conclusion is that using a smartphone for on demand note taking, casual scanning and use where permitted in a library or archive is perfectly acceptable. But I would stop short in encouraging anyone to use their smartphone for archive purposes especially for photographs. Oh, by the way, I just used the camera app that comes with the iPhone. You would have to evaluate whether or not you want to use one of the multitude of other apps available for some reason. 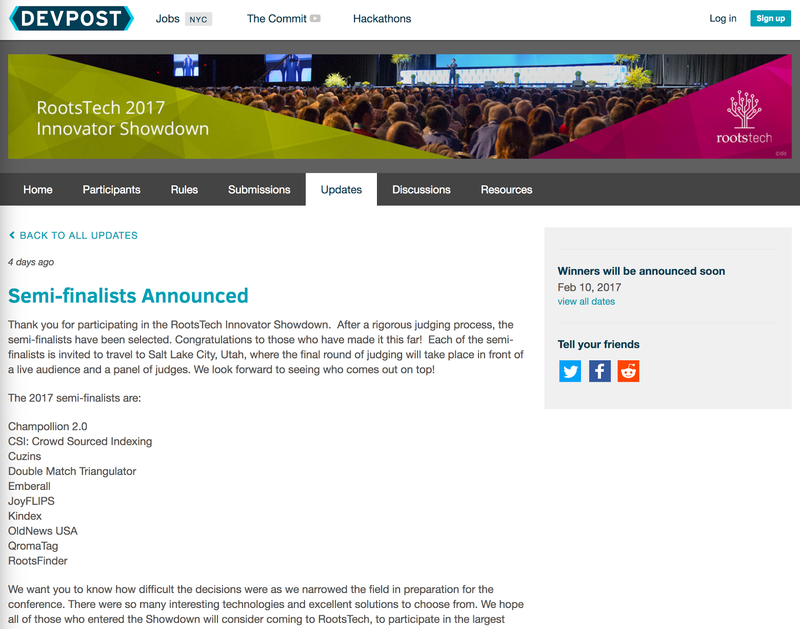 In an interesting development, the Innovator Showdown Semi-finalists were announced with an obscure post on the RootsTech.Devpost.com website. There was no press release sent to the bloggers and there was only one post that I could find on Facebook. I would not have known had Randy Seaver not posted a note on his Genea-Musings blog. Some of the Semi-finalists are well known to me and I have been communicating with them for some time. Some are repeats from last year's contest. Here is the list, unfortunately, they did not provide links in the announcement, but Randy did. There is a page on the DEVPOST website with all the submissions. Here is a screenshot of part of that page. There were a total of 40 submissions listed. If you want to get a good idea of where family history aka genealogy is going today, you can browse through the list. I have written about a couple of these programs recently. Of course, there are other important, new family history related programs that are not on that list. I will try to highlight each of the RootsTech 2017 Innovator Summit Semi-finalists between now and the Conference. I am, however, somewhat appalled at the lack of publicity given the announcement so far. Other than the tech folks, I am not sure how many of us read the DEVPOST regularly. There are two sides to the issue of finding genealogically important records: first the issue of whether or not the record exists and secondly, the issue of access or availability. Let me start with a few hypothetical examples. Let's suppose you are looking for an ancestor in the United States who lived during the mid-1800s. You would think that all of the possible issues with privacy and copyright would not apply because of the age of the documents. But as you begin your research you soon find out that even if the records exist for the time when your ancestor lived and place where you ancestor lived, those records may not be readily available for a variety of reasons. As genealogists, we often refer to the fact that not all records have been digitized or are online, but though we repeatedly refer to the need to consult paper records, we seldom envision the difficulties involved in accessing the records once they are located. This is apparently an ebook online. But when I click to see the "Full Text Online," I get the following screen. In short, the access to this "online" edition of the book is available only to the listed categories of individuals who are associated with the library. But what if I traveled to UNC and physically went into the library? 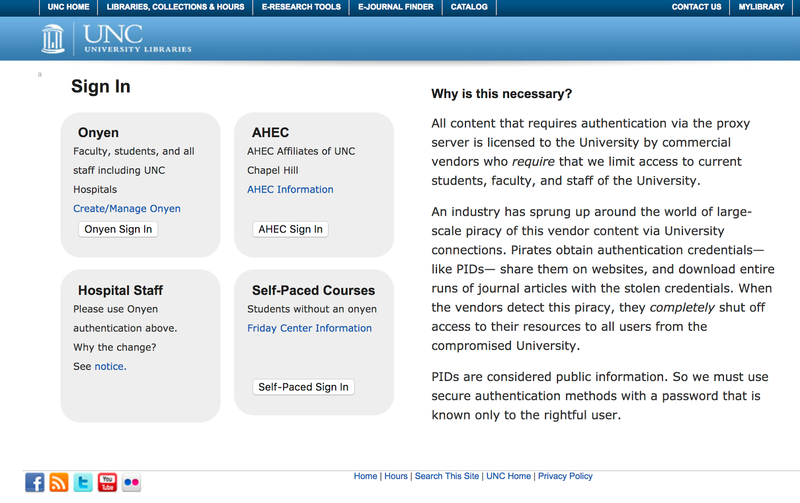 Here is a screenshot of part of the requirements for using the UNC Special Collections Library. By the way, these are in no way unique or even more restrictive than any other special collections library around the United States. But in this case, even if you did register, if the items you needed were not digitized, you would still have to either visit the library or hire someone else to do the research for you. In short, the digitization of the records may not be a solution for availability. This is actually the case with many of the items listed in the FamilySearch.org Catalog. 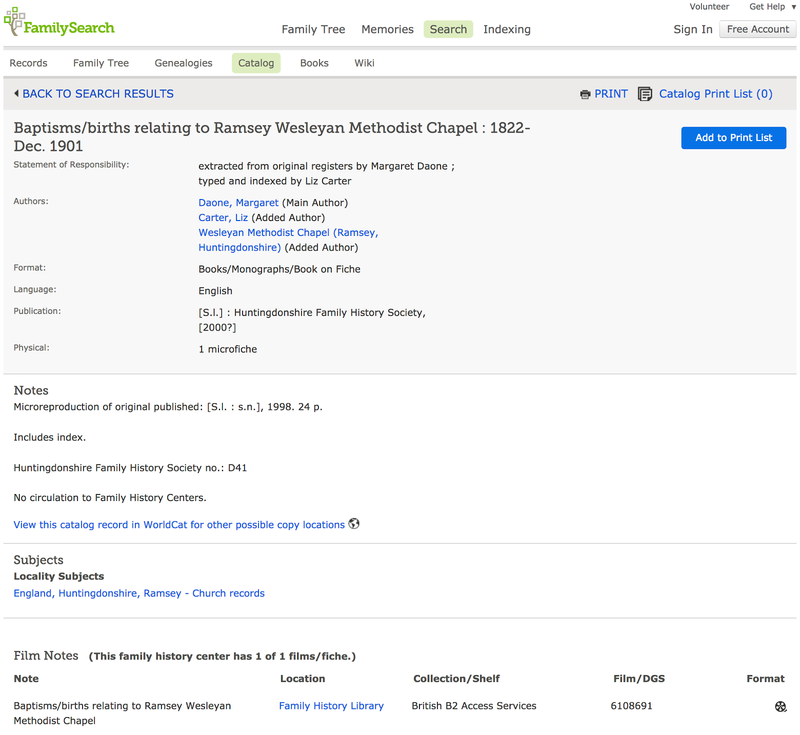 It is not uncommon to find an entry that indicates that the item can only be accessed while physically in the Family History Library in Salt Lake City, Utah. The most obvious example of this challenge is a book that has not been digitized and is sitting on a shelf in the Library. It may well be that the Family History Library has the only copy of this book available anywhere. I am modifying my hypothetical to move my ancestor from the United States to England. Even if an item in the Family History Library has been digitized or is on microfilm or microfiche, there may still be additional restrictions. Here is an example of a church record that is only viewable in the Family History Library. I have found that some of these records are not only restricted to viewing in the Library, they also require that you provide a driver's license or other ID which is kept by the Library while you view the microfiche. So, here is the challenge. 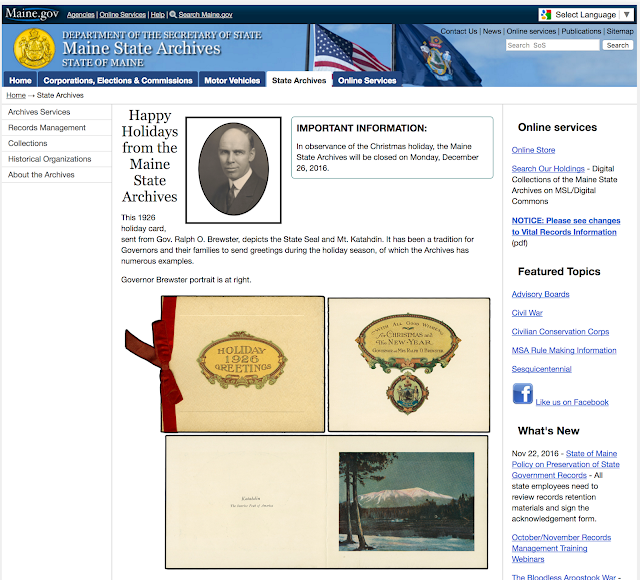 We are seeing millions of records being digitized and made available online. But it is not at all unusual to find that the specific records you need are only available while you physically visit the library or archive. This is certainly the case with the vast majority of the billions of records in the United States National Archives. These restrictions come about as a result of a variety of factors. One the most common limitations is that the record has not been digitized and even if it were digitized, it would still not be made available online outside of the facility. In the case of the English church records above, if you do some additional research online about these records, you will find that these particular records are on sale from the Huntingdonshire Family History Society. The particular record above, concerning the Ramsey Wesleyan Methodist Chapel, are available on CD for 9 Pounds sent to the United States. What these examples illustrate is that digitization and online availability will probably never make all of the genealogy records freely available. It will always be necessary to either travel to a library or archive or pay for access to some types of records. Although some aspects of genealogical research have been dramatically altered, there is still a need for good, old on-the-site research. The reality of genealogical research is that eventually, everyone will find it necessary to take the time to make a trip. This is a screenshot of the Maine.gov website for the Division of Public Health Systems, Maine Center for Disease Control and Prevention, Data, Research, and Vital Statistics -- Vital Records. 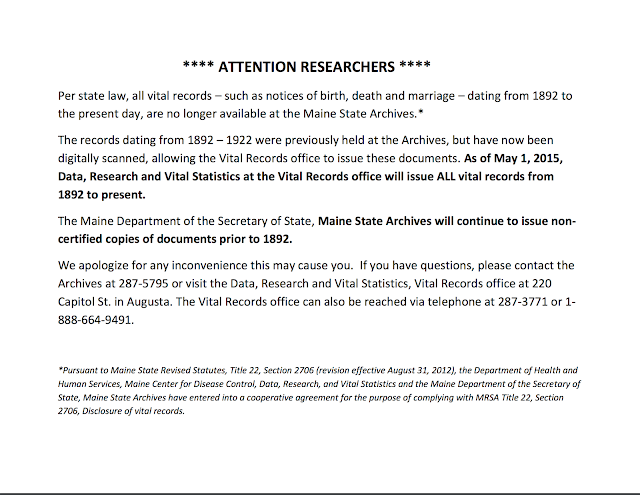 So, obtaining vital records copies in Maine is severely limited. Genealogists are required to register. Here is a quote from the Questions and Answers page. Effective July 12, 2010, all individuals requesting copies of these records must present positive identification and, if requesting the record of a parent or grandparent and you are not a registered genealogist, proof of direct lineage. 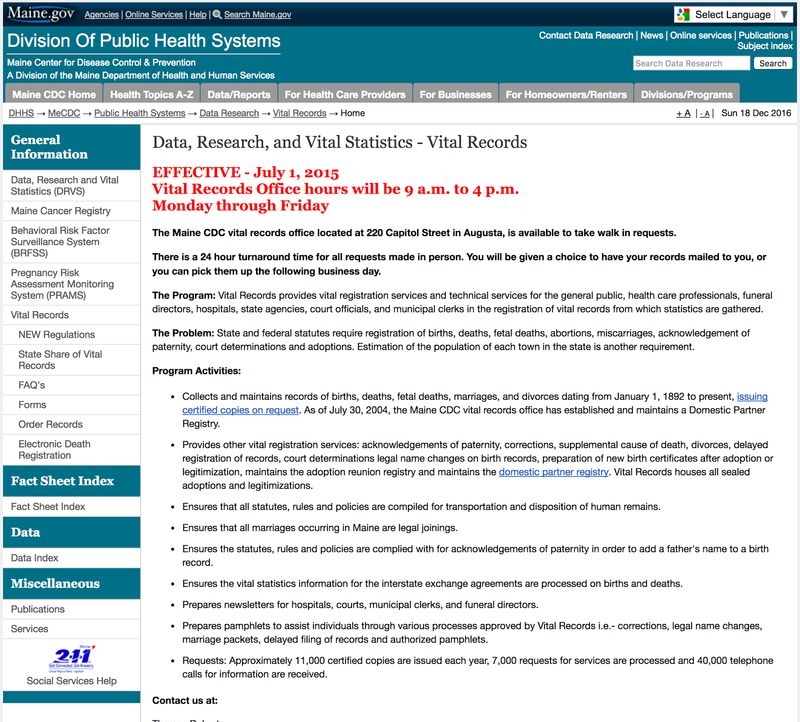 Birth records 75 years or older, marriage records 50 years or older, death records 25 years or older and fetal deaths 50 years or older are considered public records and informational copies can be issued to anyone requesting them. It turns out that some of the records are available on FamilySearch.org in the Historical Record Collections. 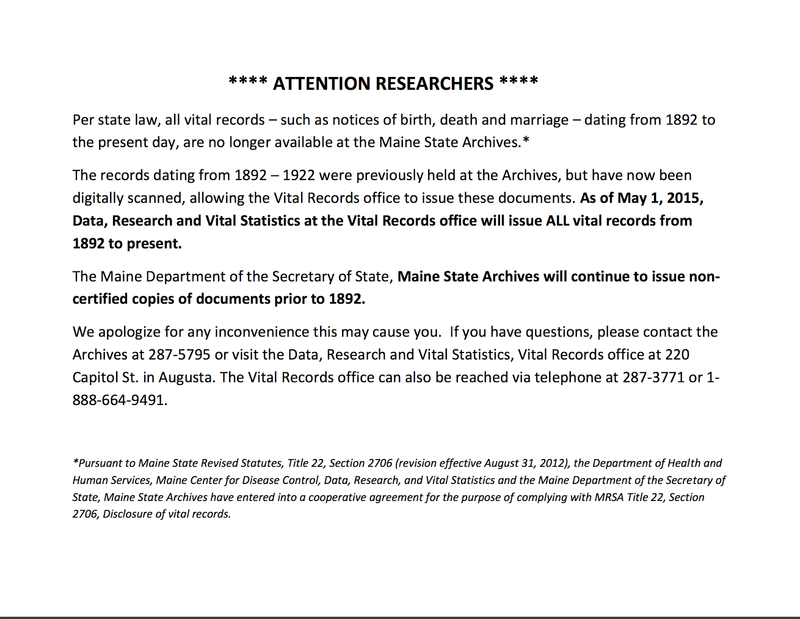 See Maine Vital Records, 1670-1921. Additional records are available on Ancestry.com, MyHeritage.com and on Findmypast.com. Digital Maine has an online collection that includes approximately 95 million pages of official state records, maps, photos and donated documents. What if my ancestors were refugees? Many of my ancestors were refugees. In America, we classify immigrants according to the political and social climate of the time they arrive. Most contemporary U.S. citizens would be very surprised to learn that the United States had no restrictions on non-citizens entry into the country until the first Chinese Exclusion Act was passed in 1882. Before that time, anyone, regardless of motivation or previous condition could simply enter the country. This is not to say that the immigrants were greeted with open arms. In many cases, they suffered intense persecution and physical isolation from those who were already here. Some of my ancestors came to America because of religious persecution. Some arrived because they were starving to death in their native land. For example, the Linton family came from Ireland during the time when they were faced with eviction and dislocation from their property and they came to Canada before coming to the United States. They were among those who were not warmly welcomed. Some of my ancestors were driven from their homes in Missouri under threat of extermination from the Governor of the state and then were again driven from their homes in Illinois and sought refuge in Mexico. I may never know the motivation of some of my ancestors but as a genealogist, I have to confront the fact that the existing records may never adequately explain how or why they came to America. If your ancestors spoke Spanish, they may have lived in America long before the invention of the United States as a country. But in many cases, they may also have come north from Latin America to escape revolutions, death squads or starvation. Unfortunately, many of these refugees are not considered refugees at all but are vilified as "illegals" and persecuted while at the same time people from more socially and politically acceptable countries are termed refugees and welcomed. We have had our own internal problems with refugees. Some of these, such as the Native American population were indiscriminately killed and forced from their ancestral homes. For example, the Navajos or Dine were forced from their lands by Federal Troops after their crops and fruit trees were burned and their houses destroyed and were forced to walk across the country to Oklahoma. What if your ancestors were on the Long Walk? Can you find them in the records? What about those who were killed or died along the way. Some of my own relatives and even my ancestors died while crossing the plains. I am here only because some of them lived. One of my ancestral families came to America for religious reasons and were so poor they lived in Boston for five years to work and save to have enough to travel across the country to Utah. There were no social programs or government sponsored interest groups to assist them or prevent them from almost starving to death in a large American city. What is the practical difference between having your ancestors forcibly removed from their country and sold as slaves in America or having them arrive because of death and destruction in their own country? Did we treat the Africans as refugees? Some of our most revered historical traditions come from our refugee ancestors. Some of my own ancestors arrived in 1620 in a small ship called the Mayflower. They came to avoid religious persecution in England by way of Holland. Apparently, many of them cut their ties with England so completely that it has proved impossible to discover their own ancestors. Despite this fact, many of our genealogical associates insist on creating a heritage for them, even tying them into the very royalty they were trying to escape. Is it any wonder that we sometimes have difficulty tracing our ancestry past these refugees? Maybe, just maybe, they were too busy trying to survive to worry about keeping records. Maybe some of them changed their names so as to hide the fact that they belonged to an undesirable group of immigrants. Maybe their memories of the "old world" were so painful, they did not want to talk about their experiences. In many cases there are records, but as genealogists, we need to be sensitive to our own history. We too are descendants of immigrants or refugees. Perhaps this can serve as a motivation for our own change of heart and acceptance of those less fortunate who have more recently come to America. Incline Software, LC, producer ofAncestral Quest™, premier family tree software for Windows and Mac, announced today the release of version 15. This new release provides exciting, easy to use new features, including the new TreeTips™ research assistant and Memories Manager, along with improvements to core screens that take better advantage of newer, higher resolution monitors. 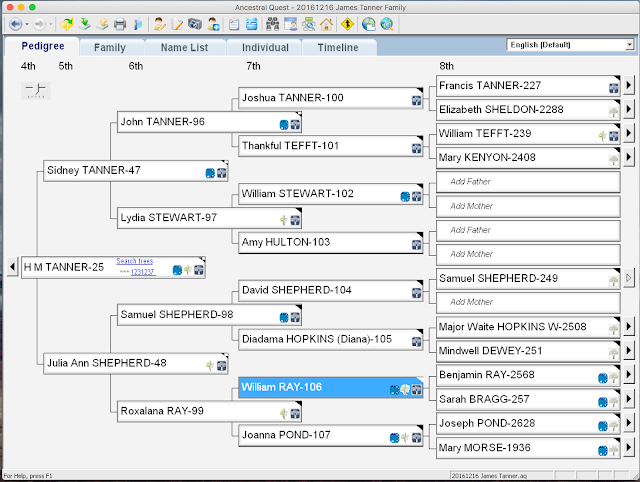 The main features added to the Version 15 update are the Record Hints to FamilySearch.org, MyHeritage.com, and Findmypast.com. One of the main draws for using Ancestral Quest is its support of those migrating from the old Personal Ancestral File program. 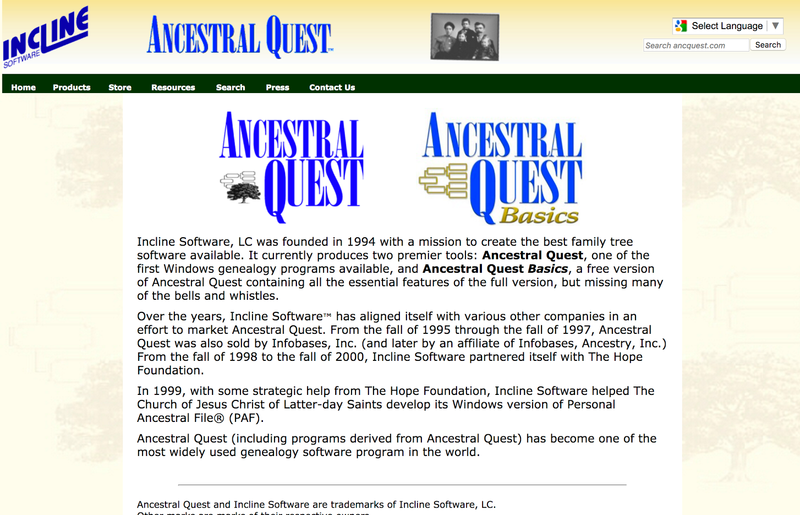 As is shown above in the Incline Software startup screen, in 1999, with some strategic help from The Hope Foundation, Incline Software helped The Church of Jesus Christ of Latter-day Saints develop its Windows version of Personal Ancestral File® (PAF). I run the Mac version of Ancestral Quest and it runs under a built-in emulator program and is just like the Windows version. Here is a screenshot of a part of the pedigree view from my program. Another major upgrade to the new version is the Memories Manager. Here is the description of the new features. Many family historians have ancestral photos, documents, and stories to share with others, and have wished there was a quick, easy method of uploading these to FamilySearch, for the benefit of their extended family. Many researchers have found that distant cousins have shared such memories about their ancestors on FamilySearch, and they have wished there was an easy way to download these family treasures to their computer. AQ's new Memories Manager views the stories and scrapbook items users have collected in their local family tree, side-by-side with the memories for the same people in FamilySearch, then uploads or downloads memories with the click of a button. Some users need to store their scrapbook items offline, so that as they share their family tree records with others, the links to scrapbook items will not require them to also find a way to transfer the media files. AQ can link a scrapbook item not only to a file on their computer but also to a file stored on the Internet. Memories Manager provides a means of linking the scrapbook items in a user's file directly to the memories in FamilySearch, so it doesn't matter whether original files are transferred when sharing databases. This can be especially helpful to those who use AQ's Collaboration feature, which allows a team of researchers to work on one master file over the Internet, using Incline Software's proprietary NetFam™ Collaboration service, without having to worry about copying photographs and documents to multiple computers. For those who use a Family Tree software other than Ancestral Quest, who would like to more easily exchange memories with FamilySearch, they should consider getting a copy of AQ, using GEDCOM to bring their records into an AQ database, then use Memories Manager to easily exchange scrapbook items with FamilySearch. Learn more about Memories Manager by watching this short video.